I’m a woman on a mission, and it’s a chocolatey one. As a lover of the taste of Nutella and a hater of its Nutrition Facts, I’ve had my eye out for any and all chocolate-hazelnut spreads, with the hopes that I might come across some healthier alternatives. When I originally tackled this problem last year, I settled on Justin’s Chocolate Hazelnut Butter Blend, and I stand by that recommendation. But, the last 12 months have brought me some new contenders so I thought it was time to revisit the world of this sweet, fudgey stuff. And, it just so happens that February 5 is World Nutella Day. Now that’s a holiday I think Americans can get behind. Disclaimer: picture in no way suggests that you should eat this stuff with a spoon. Information is for a 2 tablespoon serving. It’s strange that with such similar ingredients, the finished products can be so different. And we need to remember that straight nut butter without added sweeteners and chocolate would be a smarter choice nutritionally. As you can see from the table above, the fat’s generally lower when the carbohydrate and sugar are higher. But the clear winner here for taste and healthy components is Hey, Hey Hazelnut! 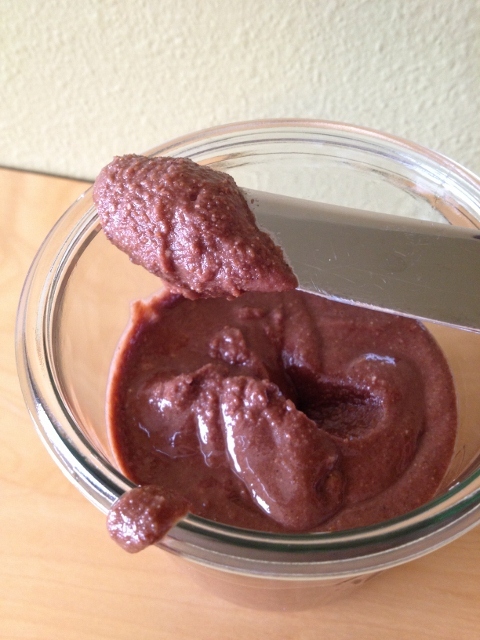 Askinosie Chocolate Hazelnut Spread; deeply, richly chocolate and oh so creamy. It’s made from: hazelnuts (oil and butter), cocoa powder, organic sugar, and roasted cocoa nibs. They call it bean-to-jar (they make it all from scratch) and it’s vegan. Weirdly, even though the company is in Springfield, MO, they source their hazelnuts from Holmquist Orchards, right up north of me in Lynden, Washington. Here’s the bad news. The Hey, Hey Hazelnut! is $13 for 6.5 oz. and it’s hard to source. You can buy it from their online store, but the cheapest shipping option adds $16. Egad! It might be worth it to give them a call so they can find the retailer nearest you. I got my jar in Seattle at Sugarpill. Can’t I Do It Better? Thick, creamy and I made it myself, using the recipe from Oh She Glows. It seems like there are more chocolate spreads making their way to store shelves, and I’ve been quickly hoarding all of them into my cart. But on closer inspection, once I got them home, I realized they don’t have one stinking hazelnut in them. If you’re thinking about branching out in the spread department, of those pictured below, the Wild Squirrel definitely wins the nutrition contest. But, Justin’s makes a Chocolate Almond Butter that beats them all. 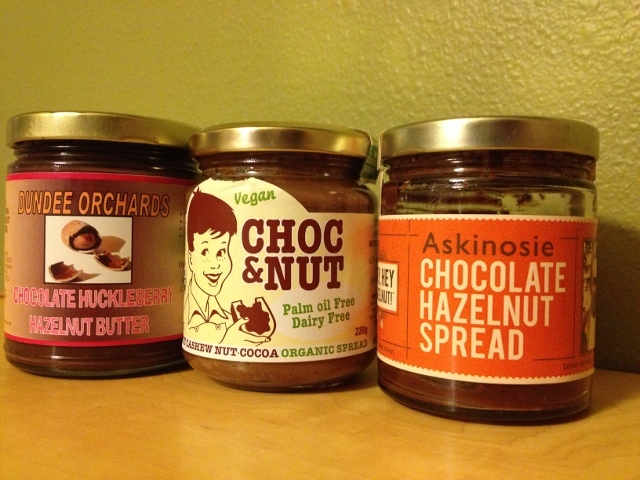 Left to right: Trader Joe’s Cocoa Almond Spread, Peanut Butter & Co. 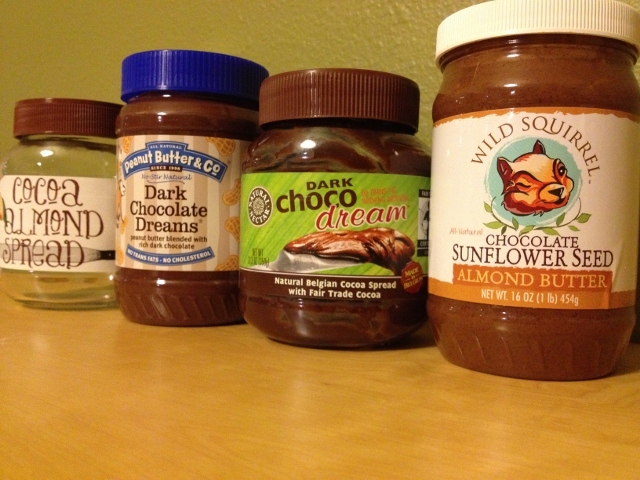 Dark Chocolate Dreams, Natural Nectar Dark Choco Dream, and Wild Squirrel Chocolate Sunflower Seed Almond Butter. I plan to continue my gluttonous quest, and I just did a quick web search for other brands. Be warned Nutkao, Loacker, Jif, Jem and Rapunzel…I’m coming for you. Please weigh in with your recommendations…are there any other chocolate-hazelnut spreads that hold a candle to the original? Loved reading your review and comparison! Thanks. Do you know which one have no palm oil? Great question. Of the hazelnut products listed in this post the only one with palm oil is Nutella. All three other products in the chart are palm oil-free. I also mention that I like Justin’s and it does use organic palm fruit oil. Im going to try the spreads on your post and I hope you do the same with the ones I reviewed! Hi James. We’re of like minds I think. I just read your post and I’m excited to try and track down some of the products you found. Thanks for stopping by. Looking for a product that does not include palm oil. Can you recommend one? Thanks. Checkout the blog post below. Hi Cat. Justin’s is my favorite, but it has palm oil. 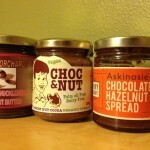 So, I’d probably say Askinosie Chocolate Hazelnut Spread for one without palm oil, but it’s hard to find. Or, I’d suggest Rigoni di Asiago Nocciolata. 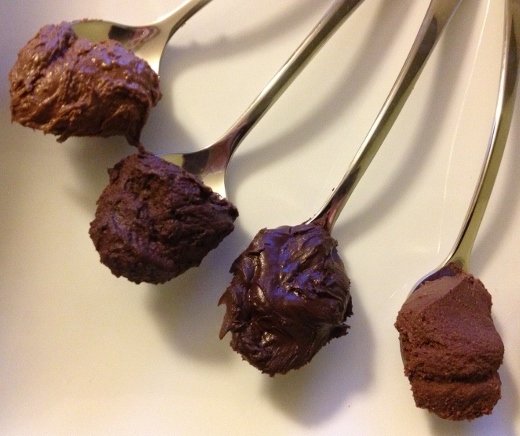 It’s got a texture similar to Nutella, but uses sunflower oil instead of palm oil. The drawback is that it’s high in sugar like Nutella, but more affordable and more widely available than Askinosie. Happy spreading! You should try our Dark Hazelnut Spread! It has 0 SUGAR, 1 NET CARB, and is gluten free, vegan, paleo, kosher, and NON GMO! Check it out on our website, golofoods.com and also on our retail website, healthylifeseasons.com! Email me if you have any questions! Hi, Have your tried Hope Foods Dark Chocolate Spreads. If you get on their website, they have a comparison with Nutella. Their products are certified organic, certified kosher, non-gmo verified and don’t contain all the junk the other brands have. You can find them in Whole Foods and other natural grocery stores in the refrigerated section – no preservatives to make them shelf stable. The only chocolate spread I will feed my family!!! Healthy and Delish!! Hi Christine. Thanks so much for the suggestion! I will definitely put it on my list to try.